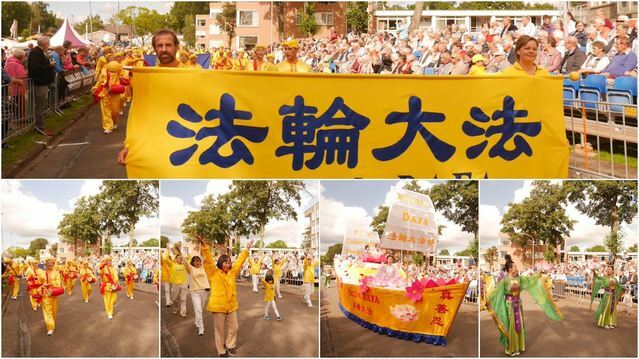 Falun Gong participated in the 61st Flower Parade and Festival in Eelde, Netherlands on September 2. The moderator excitedly introduced the peaceful spiritual practice as the colourful Falun Gong parade entry passed the stage. Four media outlets— RTV Drenthe, RTV Oost, Omroep Brabant, and Omroep Gelderland—in three of Netherlands’ provinces covered the event. They all broadcast the moderator presenting the Falun Gong parade entry. The winners of the Eelde Flower Parade over the past 60 years were invited to design this year's floats. The Eelde Flower Festival has become one of the largest cultural events in the region, attracting more tourists every year. Invited to participate in this event, Falun Gong practitioners from the Netherlands and Belgium arranged themselves into four sections: the waist drums, an exercise demonstration, a float of a golden boat with lotus flowers, and celestial maidens in traditional dress. Most of the floats in the parade were decorated with green plants and flowers and appeared dark. The Falun Gong procession stood out with colourful costumes, melodious music, and a large golden float. Many spectators took flyers. Hanny Laning, the parade organizer, commented on the Falun Gong entry, “Totally different but beautiful!” Flower company sponsors Tinneke and Harry Slachter asked for Falun Gong flyers.